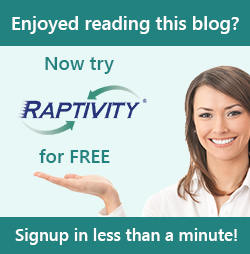 Raptivity - Rapid Interactivity Building Tool: Think you know Raptivity? Fresh off the heels of DevLearn 2015, I'd like to talk about a recent experience I had. During DevLearn 2015, I got to share a few moments with a long time customer - LVMPD and Shay Patel, a member of their content development team. During our meet, Shay spoke of his experiences with the tabbed interaction and wished he had more space for tab title headings on the top row. I shared the tab orientation feature with him that vertically rearranges tabs to gain more tab space. He was genuinely grateful and surprised that he had completely overlooked that ability. Sometimes when you’re used to viewing an interaction a given way, tunnel vision prevents you from seeing other ways or opportunities. Here at Raptivity we are focused on both flexibility and ease of customization of our interactions. Effective learning seldom happens in a fixed way or in a rigid format. The power and flexibility of our form-based customization approach in situations like this can shine through and deliver for you quickly and efficiently. In the spirit of DevLearn 2015 and Shay's 'surprise discovery' we'd like to extend a 'Think you know Raptivity?' opportunity with you, our Raptivity audience. Got a Raptivity tip to share that has proved invaluable to you or a way to work with Raptivity that has really made a difference?. Consider submitting it and share it with us. You could just find yours presented on this blog as a 'Tip of the Week' contribution.